On Monday night, I reported that Harvest Bible Chapel dropped their defamation suit against The Elephant’s Debt bloggers, their wives, and Julie Roys. As a part of discovery in the suit, Roys filed an extensive request for documents. As those documents were supplied to Roys, she published some of the internal communications on her blog. In turn, that action led HBC to ask the court to prevent Roys from making the material public. On Monday, the court declined to issue a stay on such information. Later that night the church signaled an intent to drop the suit. According to a statement released by HBC, the church wanted to spare the privacy of people who might be named in emails and texts subpoenaed by Roys. I am sure that is true. In addition, I suspect there are aspects of the church’s functioning and information about various church leaders that the church wanted to keep private. I say that because the church now keeps some such information secret. For instance, information about executive compensation and housing and other financial transactions are guarded secrets. There also appears to be an attempt to manage the reputation of leadership. Even though I support the journalists (I consider bloggers citizen journalists) in this case, I must add that I only do so because I don’t see any indication of bad faith. Some of what was written may indeed turn out to be off or incomplete, but it appears to me that those involved have tried to get the story right. I do not support people who speculate or make false allegations and claim freedom of speech as a protection from scrutiny. I have written things that turned out to be incorrect but not because I intended to. When reporting about organizations which deliberately spread disinformation or attempt to mislead, it is hard to separate truth from a lie. At times, I have gone with incomplete information because a source didn’t have all the information. In those times, the remedy is to correct as quickly as possible and apologize. In the suit brought by Harvest, a sign of what appeared to be an intent to harass was the inclusion of the bloggers’ wives as defendants. Harvest never addressed this. I specifically asked the church why they did this and the church spokesperson simply referred me to James MacDonald’s prior statements. Nothing in those statements dealt with a reason to sue the wives of the bloggers. Given the fragile legal and theological foundations of the suit and the heavy handed means of pursuing it, I think HBC’s leaders have a responsibility to correct themselves. I believe they should pay the legal expenses of the defendants and issue a public apology. The very public retreat from what HBC leaders told the public God was leading them to do is a rebuke to their leadership. First, they said God was directing them to sue. Now they say God is directing them to drop the suit. A reasonable question for members is: Do these leaders have the ability to know what God is directing the church to do? Recently, when Willow Creek Church found itself in a leadership crisis over the mishandling of Bill Hybels, the entire leadership team resigned. While the church isn’t out of the woods yet, this action helped to reassure wavering members that the church might be able to survive. It was a brave, selfless, and bold move. Harvest Bible Chapel finds itself in a similar crisis of leadership. What will the leaders of the church do? A factor which might separate the two Chicago area churches is member sentiment. At Willow Creek, there was and is a significant number of members who demanded change. I am not aware of a significant number of current members who want change. If indeed most current members are happy with the situation, then probably nothing will happen. Indeed, it is a personal matter for members to decide. In the current Harvest governance, there really isn’t a way for members to have an impact on leadership. They don’t vote for elders and they can’t recall a pastor or staff member. They can stop giving or leave the church. By HBC’s admission, over 2000 members have left over the past several years. The leaders blamed that on the bloggers. Will the public retreat on the lawsuit change the focus? Will they now look inward? Since there is no systematic means for members to have an influence on leadership at HBC, I suspect that those who are dissatisfied will continue to trickle away. Although a bold leadership move could probably prevent that, it is probably as it should be. No doubt there are many small struggling churches which could use some new members. Ultimately, it would be wonderful if the HBC board and senior pastor repent of their actions in this lawsuit, make restitution to the defendants, and at least consider a sabbatical from leadership to determine why they thought they should pursue such an extreme public action. Trust in Christian leaders is at a low right now and it would nice to get some good news for a change. 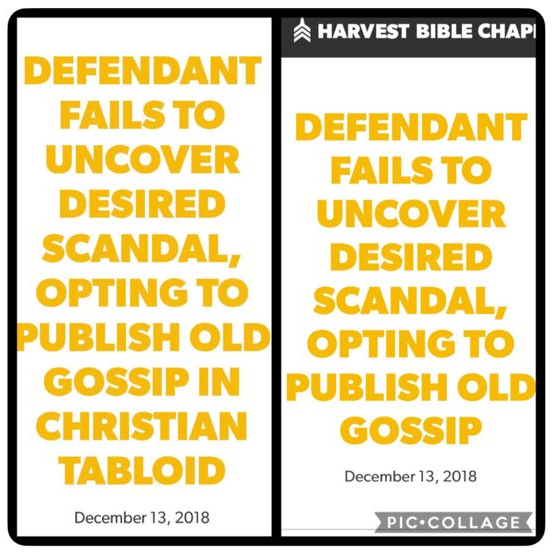 I just heard via Twitter that Harvest Bible Chapel dropped their defamation lawsuit against The Elephant’s Debt bloggers and their wives, and Julie Roys. This came after a judge did not grant a restraint against the publication of material obtained via discovery. Here is HBC’s announcement from the church website. In October of 2018, we filed a lawsuit asking a civil court to restrict the actions of those attempting to interfere in the life of our church by publicizing false and distorted information about our church, primarily related to the years 2007-2012. Recent events have made it clear that any further private content subpoenaed from third and fourth parties will likely be publicized online. Case law contains many legal precedents related to restricting these actions, yet the court ruled against our motions in both instances. * The result is that even if we filed a motion to reconsider, even if we amended the complaint to exclude private matters sensitive to some third parties, the court appears unwilling to protect our many friends, including those with whom we seek to reconcile. In good conscience we cannot knowingly subject innocent people, in many instances against their will, to a full subpoena process. Surely the Lord could have caused the court to rule in our favor, as “the lot is cast into the lap, but its every decision is from the Lord” (Proverbs 16:33), and “the king’s heart is in the hand of the Lord, like the rivers of water; He turns it wherever He wishes” (Proverbs 21:9). We receive these outcomes as God’s direction and have instructed our legal counsel to drop the suit entirely. With this decision, we can again focus our energies on continued growth in personal and organizational faults we have owned, enduring what is false, and striving to mitigate the damage such attacks bring to our church family and friends. We remain willing to meet with the defendants for a face-to-face resolution of grievances, and we covet your prayers. *At our request, a court reporter transcribed today’s proceeding, which will be available soon. A common sense view of this situation is that the bloggers and journalist have free speech rights and the courts are keen on maintaining them. It always seemed odd to me that a church would use the courts to attempt to establish a fact pattern. If the church wants to be transparent, then simply open the books and the minutes and take questions from the press without a defensive posture. The Executive Committee of the Elders has declared a moratorium on all efforts to minimize or marginalize our critics, except a carefully considered and conscious decision to pursue a legal remedy regarding attacks against the church that upon advice of counsel we believe are illegal. Time will tell if church leaders will honor that promise. In my opinion, they should drop the suit. As I pointed out this morning, the existence of the suit heightens the tension and animosity. I doubt that a nicer tone in public remarks will change that. In what seems like a violation of the spirit of that pledge, the church continues to refer to “three named defendants.” There are five. I cannot understand why the church continues to speak as if the wives of The Elephant’s Debt bloggers haven’t been sued as well. The lawsuit against our three named defendants, moves slowly forward and again we state that we would gladly accept no financial settlement, no resolution of damage done or redaction of existing slander. All we ask is that they agree to stop attacking our church permanently and entrust the ongoing reforms to the Elders of our church. I asked the church about this and did not get an answer about why the wives are being sued. You can read the rest of the response from the elders here. 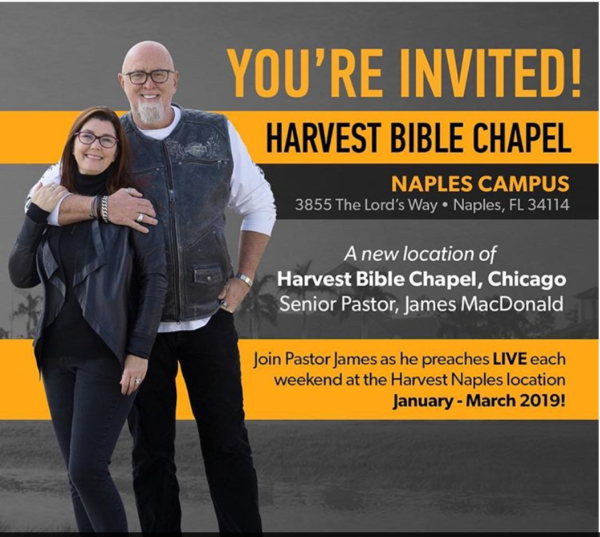 Harvest Bible Chapel: Mars Hill Church 2.0? From where I sit in small town PA (usually at a fast food place with good WiFi), it appears that there are some similarities between the last couple of years at Mars Hill Church and the current situation at Harvest Bible Chapel. At MHC, trouble had been brewing for several years over treatment of elders and perceptions from departed members and elders that Mark Driscoll was domineering and unnecessarily harsh. 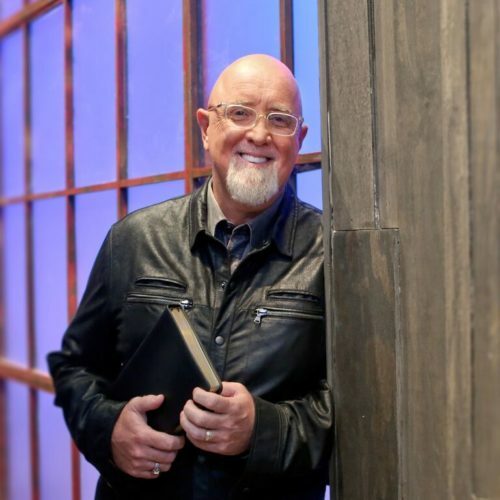 The same perceptions and polarization have occurred at HBC involving their founding pastor James MacDonald. This morning I became aware of something called the Statement of Record on the HBC website where former and current elders are pledging loyalty to MacDonald. Up to the very end of Mars Hill Church, a core group of elders and members remained committed to Driscoll and expressed animosity toward the elders who brought formal charges against Driscoll. Also this morning, the Elephant’s Debt blog posted a resignation letter from a former elder and staff member. In the letter, questions are raised about the leadership of MacDonald and financial management of the church. This letter along with the texts and emails posted earlier by Julie Roys remind me of various leaked letters and formal charges written by current and former MHC elders concerning the leadership of Mark Driscoll. Many of the concerns seem similar. Driscoll’s charges included allegations of harsh treatment of subordinates, domineering leadership style, and using the church structure to enrich himself. Similar allegations have surfaced regarding HBC and MacDonald. It should also be noted that Driscoll and MacDonald have a relationship which dates back to the Mars Hill era. MacDonald was on MHC’s Board of Advisors and Accountability. He resigned near the end of the church’s life in 2014. Recently, Julie Roys reported that HBC gave $50,000 to Driscoll’s new church in Phoenix. And who can forget the little trip by MacDonald (on the left) and Driscoll (right) to John MacArthur’s Strange Fire conference. Another similarity I see is the adversarial relationship between critics and defenders in both situations. There were sharp differences and strong feelings in the MHC camps. The same dynamic is at work here. When MHC responded to public or media questions, they were cagey and defensive. In private, the sides were fierce in opposition. In the HBC case, a lawsuit is in play. This really ratchets up the polarization. I can’t see it getting any better as long as HBC maintains the defamation suit. Putting aside biblical arguments for or against the action, I think it is a terrible precedent to set as a matter of public perception of how Christians do things. The tension and animosity will only escalate with each new revelation. In MHC’s case, the church was always the PR loser when differences emerged into the light of day. Those supporting MHC’s establishment felt their situation would get better if they could just make their case in the court of public opinion. During the church’s demise, MHC had the blessing of the ECFA, touted numerical results, and portrayed a measured and positive front. However, each new disclosure had a cumulative downward impact. In HBC’s case, the existence of the lawsuit has great potential to multiply this effect. I suspect there are more parallels but I think this is sufficient to make a point that MHC could be a learning experience for those who have ears to hear and eyes to see. Fair or not, a prolonged public war will erode the church’s effectiveness and probably do more to harm the bottom line than anything the bloggers have done up to now. Author Warren ThrockmortonPosted on December 21, 2018 December 21, 2018 Categories Harvest Bible Chapel, James MacDonald, Mark Driscoll, Mars Hill ChurchTags Harvest Bible Chapel, James MacDonald, Mark Driscoll, Mars Hill Church12 Comments on Harvest Bible Chapel: Mars Hill Church 2.0? UPDATE: HBC has responded to Julie Roys’ post. Without talking to Mr. Williams, they believe he didn’t mean it. We believe that Randy Williams is not the man portrayed in the texts publicized by Julie Roys. He has never said anything to the leaders of our church in the many years we have served with him that resembles the content of the texts she published today. If Randy Williams was secretly antagonistic about the health of our collective governance, it was not known to any of us. We offer him the grace we all need in the context of regrettable words or actions. Love prompts us to believe he does regret these words. After a positive and warm lunch with Jason Acres today, Randy has not been available to us by text or phone. Based upon what is known about his love for our church and Pastor James, we believe he must have read what Julie Roys published and felt devastated. Love compels us to believe the best; if that is not the case, we will of course make it known here. Key points are below (if you’re in a hurry, read points 10-13). Read the entire response here where current elders contest what pastors White and Borinstein wrote in their texts. Call this the fruits of discovery. This morning, Julie Roys, journalist and one of five defendants in Harvest Bible Chapel’s defamation lawsuit, posted emails of a current elder accusing senior pastor James MacDonald of control and manipulation. The elder and former chairman of the executive committee Randy Williams also indicated that the church had endured financial mismanagement, and governance failure. Roys reproduced the email thread on her blog. The problem is James. His control, his manipulation, his anger, his torching of others to protect his reputation, the wake of his irresponsible financial stewardship and direction of his organization. The continued manipulation of people and narratives. The problem is James. No church would ever allow their Sr Pastor and leadership team to act over a long period of time with such a blatant lack of transparency or in a culture of fear. . . . We were told by James in a meeting that HBC paid for the systems upgrade and they were giving it to us for free (yet we were charge(d) $500K), we were never told that 10% of our funds were given to WITW (Walk in the Word), we were never told that the bylaws of our organization were changed in 2014 . . . we were never told about a 100 year lease the HBF was signatory to or that the HBF would be paying operating expenses for the training center in Croton (including staff), we were never told that designated funds for Harvest Gives were being held and not paid out… do I need to go on. . . . I know not one pastor who cares that James lives in a $4-$5 million* dollar house, what they care about is his publicly lying about it and the lengths he went to hide it (all while he was president of our organization). Where is the integrity in that? . .
Borinstein and White are on the board of the Great Commission Collective which is the subject of the HBC elder update in 2017 and no longer has a relationship with James MacDonald. An earlier version of this post referred to Borinstein and White as HBC elders. That is not the case. I apologize for any confusion that caused. Removal of Senior Pastor. Subject to the rights, if any, under any contract or covenants of employment with the Church, the Senior Pastor shall only be removed, by unanimous recommendation of the Executive Committee and by the consensus of the Elder Board at any general or special meeting duly noticed pursuant to Section 7.05 of these Bylaws. The Senior Pastor shall only be removed from office, subject to the terms of any employment agreement or covenants, for any of the following reasons: (i) disqualifies himself as a result of a violation of the Sexual Immorality Policy; (ii) engaging in conduct that is in opposition to the best interest of the Church; (iii) teaching doctrines inconsistent with the Bible; (iv) neglect of duties; (v) resignation; or (vi) death, long-term disability or incapacity. I also asked for a comment or reaction from HBC to Roys’ post but they did not reply by the time I posted. I will add any responses here. 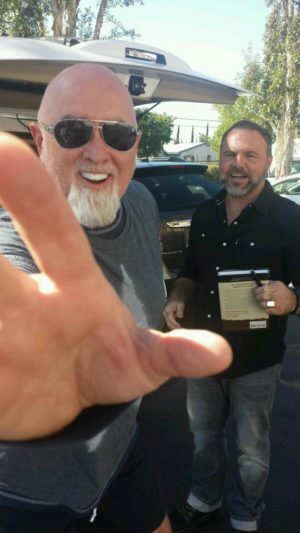 1/2 Statement from Dr. Danny Wood, president of #SBCPC19: “James MacDonald contacted me personally to say he is stepping away from all outside speaking engagements for a season (including Pastors Conference 2019). MacDonald and his church have been the focus of renewed critical social media attention since the church filed a defamation suit against two bloggers and their wives and journalist Julie Roys. Roys recently filed an article on the church with WORLD magazine. MacDonald has asserted that the bloggers at the blog The Elephant’s Debt and Roys have not portrayed the church honestly and the legal action is justified to bring legal sanctions against the illegal actions of the defendants. I recently asked the church why the bloggers’ wives were included in the suit since they haven’t written anything about the church. The church through a spokesperson declined to add anything to what is posted on the church website. Currently, there is no mention of the wives on the church website. On Thursday, WORLD published the long anticipated article on Harvest Bible Chapel. Written by Julie Roys, the article gives a summary of various concerns expressed by former members and observers of the Illinois megachurch. Roys is also the defendant in a defamation suit brought by HBC. In a specially called meeting on September 29, the Elders of Harvest Bible Chapel carefully considered our biblical options related to three individuals, who have long been outside of our church. Our goal was to end their prolonged and divisive effort to undermine the Elder governance of our church and to discredit our primary leaders. We have chosen to accomplish that by filing a civil suit in Cook County. With the wives of the two bloggers involved, there are five defendants, not just three. HBC has responded to the WORLD article. Actually, they responded once and then quickly altered at least the headline on their website (see below). It is a sad day when once-credible Christian publications consider the opinions of a few disgruntled former members, already rehashed ad nauseam, of greater weight than the carefully expressed viewpoint of a plurality of local church Elders. Harvest Bible Chapel has owned its mistakes and endured to become a happier and healthier church, whose members recently pledged — financially, in their walk/work for Christ, and in their promise to share Christ with others — at unprecedented levels. The anticipated attack that comes with God’s kingdom moving forward has come, sadly, not from those in the world but from other professing Christians. Christianity Today published an article covering the story yesterday. I am looking into several other aspects of HBC’s ministry and hope to write more next week based on communications I have had with the church.